In no other country is the abyss between the official – such as folklore clichés broadcast through the media – and village musical traditions so great as it is in Russia. During the Soviet era folk music was used as a self-serving instrument by the political powers: music always had to praise the magnificence of the Soviet way of life. An official ‘folklore sound’ was imposed, a regime-friendly repertoire was sanctioned, a training network for ‘culture workers’ created. Shielding oneself from these products on television and radio was impossible. At the same time, the calendar songs and songs celebrating important life rituals (e.g. Christmas, Easter, or wedding songs) were not found in the official repertoire, as this music was associated with church and pagan customs. And of course, these old church and village customs were unwelcome remnants from the Tsarist era. Authentic music became ignored, and at best, was tolerated, which rescued and protected it from the homogenization process of the official sound, with its inherent censorship of text and style. 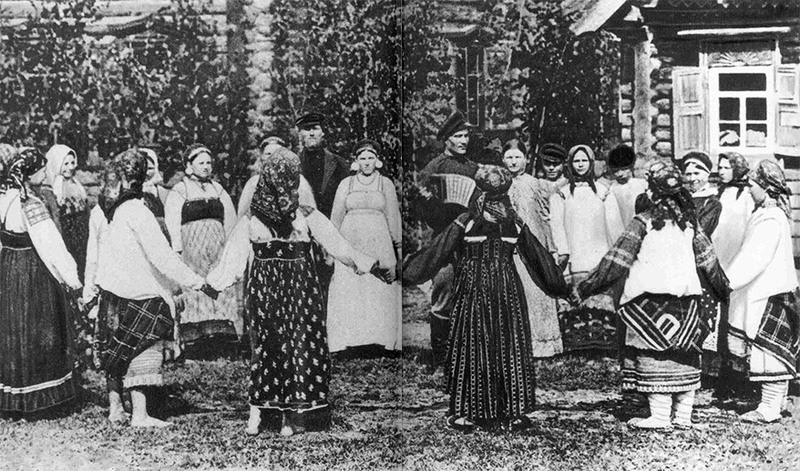 This musical material is probably the oldest that has been passed down from Russian folklore tradition: the songs that were sung upon special ritual occasions were always performed in a particular way – just as grandmothers and grandfathers had always sung them – generation after generation. When women sing their sowing and harvest songs, heaven and mother earth join in their bodies. They sing from earth to sky with feet stamping, with arms sweeping and swinging in the air, and use their very breath to raise up their voices to heaven. They celebrate and praise this coming together and invest their entire power in this, in order that peace and fertility are brought forth.